As you may remember from my post last week, my mom and grandmother both recently celebrated birthdays, and this past weekend, the hubs and I traveled home to NY so we could celebrate with them! I was in charge of the birthday dessert, and I thought cupcakes would be fun (as they always are!). 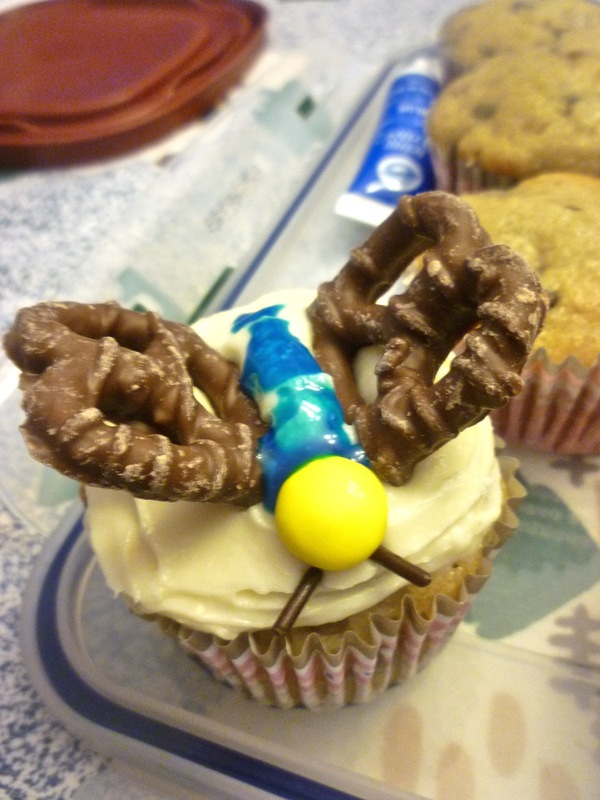 My grandmother has always loved butterflies, and a while back I had seen a great little tutorial on how to make butterfly cupcakes from Martha Stewart, so I thought that this special dual-birthday celebration was the perfect time to make them! And here's the recipe for the actual cupcakes for you! They were awesome. The recipe for the banana chocolate chip cupcakes is from Cookies & Cups, the same blog that inspired my recent pinwheel cookies recipe. The only difference I made in the cupcakes is substituting yogurt for buttermilk, simply because I didn't have buttermilk on hand. The frosting recipe is just a classic, easy version of cream cheese frosting, and I'll post that below too. Preheat oven to 350 degrees, and line muffin pan with cupcake liners. In medium bowl, sift together the flour, baking powder, baking soda, and salt. Set aside. With an electric mixer, cream together the butter and both sugars until well-combined. Add the eggs and vanilla and mix until incorporated. With your mixer on low, add the dry ingredients and yogurt (or buttermilk) until combined. Mix in the mashed bananas, and finally stir in the chocolate chips. Fill cupcake liners about 2/3 of the way full, and bake for 20 to 25 minutes, or until a toothpick inserted into the center comes out clean. Cool completely on wire rack. Beat the butter and cream cheese together until well-combined. Add the vanilla extract and mix, and finally, slowly add in the powdered sugar and mix until the frosting reaches the desired consistency and is smooth. To assemble a butterfly, first frost the cupcake. Next, create the body of the butterfly by using colored icing on top of the frosting in the center of the cupcake, as you see below (I used a couple different types of icing, including these and these). Then put an M&M at the top of the body, and place two pretzels on either side of the body for the wings. And finally, place two sprinkles or small pieces of thin licorice near the head for the antennae. Easy as that! The flavor of the banana chocolate chip cupcakes was wonderful - very banana-y (but not too much so) and incredibly moist. You could probably even eat these cupcakes as muffins, if you wanted! And pairing the banana chocolate chip cupcakes with the cream cheese frosting worked really well. These cupcakes come highly recommended by my family and me! Btw, this post is linked up to Taste and Tell Thursdays!